The Kona Crime Prevention Committee recognized Officer Kalae Lee as “Officer of the Month” for December in a luncheon ceremony Wednesday (December 4) at Huggo’s restaurant in Kailua-Kona. Lee was honored for his successful investigation of a methamphetamine dealer. In July 2013, Lee received valuable intelligence that a man was distributing large quantities of “ice” in North Kohala. He conducted a month-long investigation with assistance from North Kohala Community Policing officers. The investigation led to the identity of a suspect and confirmed the reports of meth distribution. 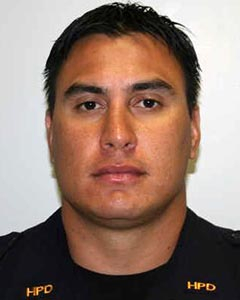 Officer Lee drafted and obtained search warrants at a Kapaʻau home, where police recovered 4 1/2 ounces of crystal meth hours before it was to be distributed into the small community of North Kohala. The drugs had an estimated street value of $14,750. At the scene, police arrested two people. A 46-year-old man was arrested and later charged with first-degree meth trafficking and drug paraphernalia. A 28-year-old woman was arrested and later charged with promoting a dangerous drug and drug paraphernalia. Detective Edwin A. Buyten from the Ice Task Force recommended Lee for the award and commended him for his investigative skills. “Officers later learned the community was extremely pleased with the Hawaiʻi Police Department’s effort to disrupt the flow of narcotics within their community and protect their children from dangerous and harmful drugs,” Buyten wrote in nomination papers.